Similar in feel to Cherry MX Blue, Greetechs offer a keystroke smoothness on par or better than their Cherry counterparts. I bought a Das Keyboard 4C that had these switches after I fell in love with my 4 Ultimate that had Cherry MX Blue switches. I absolutely hated them. They are an acoustic and haptic disappointment when compared to the Cherry MX Blues. really cheap and sort of mushy compared to other switches but they arent horrible. 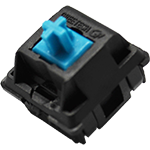 Have experience using Greetech Blue switches? Add a review to share your knowledge with the keyboard community.